Remember I posted about my article Love, Rage and the Occupation, which got published on Journal of Bisexuality? So, I discovered that I can put the text on my blog without breaching copyrights. Now everyone can read it for free. Hooray! Since this article is very long, I’m going to be posting it in parts over the next few weeks. This is part 2 out of maybe 8-9, so stay tuned for further updates. In that summer, the Jerusalem pride march was canceled. 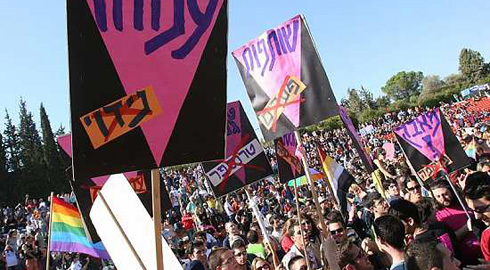 Jerusalem Pride became a hotly contested territory three years after its inception. From 2002 and until 2004, it ran annually, relatively smoothly and with few negative side effects. However, the parade came to national attention in 2005, when a single terrorist (an orthodox Jew) stabbed three of the attendants with a knife, with intent to kill. (Interestingly enough, the person who jumped the perpetrator and caused his arrest, was one of the Jerusalem bisexual activists). When, one year later, the Jerusalem Open House1 had started organizing an international pride parade in Jerusalem (under the ironic title of “Love Without Borders”2), a city dominated by religious populations sprouted a hitherto-unforeseen coalition between the Jewish, Christian and Muslim communities not to let us dirty perverts march in “their” city. The police’s official reason for denying permission to march was… the Lebanon war, deciding it was “unsafe” to march at such a time.